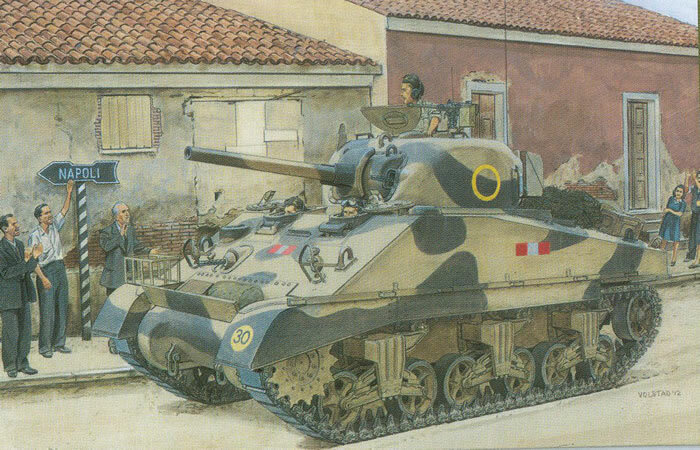 I had not realized prior to receiving a note from Peter Brown that the two most prevalent Sherman versions available to the 8th British Army for El Alamein were the Sherman II (M4A1) and Sherman III (M4A2) versions. DML has now stepped up with the latter variant and used different bits and some new parts to replicate the early direct vision version of this tank. What comes in the box is an M4/M4A1 direct vision hull with the sprue of M4A2/M4A3 detail parts, the low bustle early production turret with optional M34 or M34A1 gun mounts (this requires the M34 with narrow mantlet), the generic early production M4 VVSS bogie sprues with the additional “spoked” welded wheel sets, a three-piece transmission cover or optional blunt cast cover, T41 tracks (DS plastic single runs), and the British-added bustle bin. The hull is new top and bottom, and a “slide molded” three-piece transmission cover is also new to the family. Specific details are provided to give two options to the grouser bin vents at the rear of the hull and either an open or closed set of engine access doors at the rear of the hull with two styles of “locking door” (but no interior components). The kit comes with the early “square” air cleaners as well. Since this kit covers the British version it comes with a full set of etched brass sand shields and fender racks, including one that appears to be for the British style petrol tins on the right front fender. New design headlight guards (e.g. easier to fold and install) complete with a folding jib as well as the commander’s “blade” sight are provided. Finishing directions and markings are included for five tanks: C Squadron, 4th County of London Yeomanry, Italy 1943 (sand/grey with flashes, circle); B Squadron, 4th County of London Yeomanry, Italy 1943 (sand/grey with flashes, “Bramham Moor”); HQ 3rd County of London Yeomanry, Sicily 1943 (sand/grey, bow flash, diamond marking); A Squadron 44th RTR, Sicily 1943 (sand/grey, flashes, triangle 5); A Squadron, 29th Armoured Brigade, Tunisia 1943 (sand/grey, flashes, triangle). A sheet of colorful Cartograf decals are included which also provide the aerial recognition roundels. I have no idea how accurate the markings as DML has had a problem in the past converting technical input into accurate markings. Overall, with some aftermarket decals this variant will fill in the blanks for everything from late 1942 through 1943 in the Mediterranean theater.